Appearance: Throughout the centuries, the most common description of a griffin has been that of a creature with the body of a lion and the head and wings of an eagle. But additional and sometimes conflicting depictions abound. Griffins might have the head of a hawk or falcon, instead of an eagle. They might, in some cases, be wingless. Sometimes they were depicted with lion’s body, forelimbs, and hindquarters, but other times they were assigned the front legs and talons of an eagle. Most had elongated ears which stood upright, like those of a horse, but sometimes these ears were feathered or even rounded and floppy. On its neck and chest, the griffin might bear either feathers or the mane of a lion, but in either instance fur covered its body, often brown or black in color, while wings and feathers might be mottled, white, or even blue. Their tails most often appeared akin to a lion’s, but occasionally a feathered or serpentine appendage might show up. All these elements, coupled with fiery eyes and massive size (one claw of a griffin was said to be the s ize of a cow’s horn), made the griffin intimidating in appearance. Unique qualities and traits: As with many mythic creatures, certain parts of the griffin were believed to possess medicinal qualities—the claw would detect poison and change color thereby protecting the bearer from illness or death, the feather would heal blindness. Because of the belief in the powers of these objects, antelope horns were sold as griffin claws, ostrich eggs as griffin eggs, and so forth, all commanding a princely price. For the most part, legends portray the griffin as a uniquely powerful and majestic creature, and it symbolized courage, boldness, and intelligence. As a blending of the king of the earthly beasts and the king of the aerial creatures, many accounts talk of the griffin having dominion over earth and sky. Such allusion also ties into the symbolism that became prevalent during the medieval era—the griffin as a representation of Christ (the lion representing the man and the eagle, the divine). Though such an analogy falls short, due to it, griffins found their place decorating churches of the era. In that country be many griffins, more plenty than in any other country. Some men say that they have the body upward as an eagle and beneath as a lion; and truly they say sooth, that they be of that shape. But one griffin hath the body more great and is more strong than eight lions, of such lions as be on this half, and more great and stronger than an hundred eagles such as we have amongst us. Unswerving dedication to their mates ran so strong in griffins, that if one died, the remaining griffin would never take another mate. Due to their attraction to gold, griffins became legendary as guards of hidden treasure. Some legends claim only female griffins have wings. 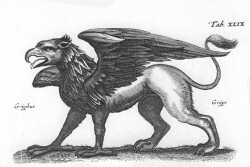 Sources from myth and legend: Griffins appear in the artwork of the Babylonians, Assyrians, and other ancient cultures. In addition, though none claimed eyewitness accounts, many historic records discussed griffins, though they suggest different origins (India, Ethiopia, or mountainous regions in Asia). They also make a showing in Greek and Roman mythology. Some theories suggest they were created due to a natural association between eagles and lions (both regal and powerful in their own realms), but regardless of who first invented the creatures, their origins are ancient and their appearances in hundreds of years of history, oral tradition, and literature frequent. 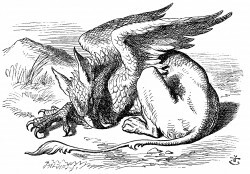 Drawing closer to modern day, they make a showing in some of Grimm’s Fairy Tales, such as The Griffin, in which the griffin portrayed is hostile to humans, but wise, possessing answers to the most obscure questions, and in The Singing, Springing Lark, where a griffin provides a ride to a woman in search of her husband, as well as numerous novels. Overview: By nearly all accounts the griffin was a majestic, and sometimes terrifying, creature. Even when depicted as smaller (approximately the size of a normal lion), their strength exceeded that of a natural animal many times over. Their friendliness to humans was questionable, and their size and strength great enough to easily carry off a grown man as prey. Due to their association with gold and hidden treasure, they were sought after by humans, despite the danger…and some claim, made extinct by this hunting, or chased into obscure mountain regions where they could live in peace. Though now regulated to the realm of myth and legend, they have proved one of the more enduring mythic creatures and still capture people’s interest to this day. Your opinions: Why do you think griffins have remained so popular over the centuries? What about them is appealing? Do you have a favorite mythic creature or one you would particularly like to see featured here? Please share. This entry was posted in Mythic Creatures and tagged griffin, gryphon. Bookmark the permalink. How interesting! I love hearing tales and facts about mythic creatures. For me personally, I find griffins appealing because I’ve always liked both lions and eagles, so naturally a cross between them in fantasy form is quite fascinating to me. Also, a creature that could fly and also has the power of a lion must be quite a sight to see. Furthermore, it’s significantly bigger than both animals, increasing it’s abilities.That taps into what interests me about griffins. Yes, I think that the power and majesty of both the real animals the griffin is based upon adds to its intrigue. Each animal has so much nobility in its own right that to envision a merge of the two that kept the best elements of each and added mythic power on top of it makes an intriguing enough creature to last through the centuries. might be a lion because the back of the griffin’s body is a lion and there is where the womb is. i would think that it was hatched from an egg because griffins do lay eggs. Are Griffins good or bad? I love Griffins they are so strong,fast,and can do lots of damage. Thank you so much! This is great for school projects. You’re even in the credits! I am a Ravenclaw, idle Gryffindor. Study for your O.W.L. this is really going to help me on my essay! Thanks! I have a friend named Griffin. He has beautiful green eyes. Was there ever a mention of the color of eyes of griffins?